Enseble ACJW with John Adams as conductor perform "de Staat" this evening at Carnegie Hall. Program notes by Robert Adlington. To see archive video of "De Staat" from 1978 Holland festival in Carre Theatre go to July 9, 2009 post on this blog. 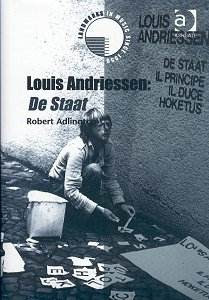 Adlington's book, Louis Andriessen: De Staat, Ashgate, 2004.